With Tropical Depression Harvey moving toward the Texas coast, our largest concern for the region is not the wind or the potential storm surge. Instead, Harvey’s greatest impact will come from inland flooding. Current forecasts predict anywhere from 10 inches to more than 20 inches of rain during this event for parts of Texas, which may well include Houston. As the storm approaches, you should be aware of what inland flooding is, and how to prepare for it. When a tropical system makes landfall, it begins to deteriorate and collapse without the energy from the warm ocean to feed it. The moisture within the storm precipitates out, often in torrential rainstorms that can last for days. Additionally, if the system moves slowly or stalls, heavy tropical downpours can lead to flood conditions hundreds of miles inland, far from the point of landfall. Tropical systems hold millions of TONS of water, and all that water falls as rain, eventually. This leads to major flooding, something Houston is all too familiar with. With inland flooding from tropical storms, it can mean—in a few extreme cases—getting 30 inches of rain, or half a year’s worth, in three or four days. Keep in mind, wind speed of a tropical system is not an indicator of how much flooding may occur. Tropical Storm Allison never became a hurricane, and was barely even a tropical storm by wind speeds, but because it stalled over our region Houston experienced days of these heavy tropical rainstorms. The figure above also shows the difficulty in predicting what areas will flood the most. 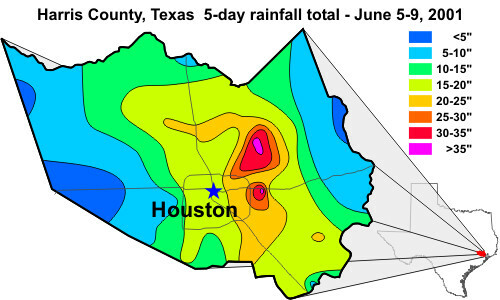 In Harris County alone, rainfall totals ranged from less than 5 inches to nearly 40 inches during Allison. Any small change in the storm’s path or intensity is the difference between flooding or light precipitation. And to be clear, we are not saying Harvey will be another Allison, only that there is potential for severe inland flooding from Harvey. Most weather models give us a general idea of how much rain will fall over the region, but they cannot say exactly how much rain will fall in a specific neighborhood or town. This is why we issue watches and warnings, and emphasize the need for awareness during an inland flooding event. If 15 inches of rain is forecast, prepare for 15 inches–but also, prepare for the possibility of more, or barely any at all. With rains from tropical storms, the amounts can be unpredictable, the rainfall rate can be high, and the flooding can be extremely localized. What should I do to prepare? Should I evacuate? As of now, there are no evacuation orders for the Houston metro area. In fact, intense inland flooding can trap evacuating motorists, which also makes it more difficult for emergency crews to work. Unless local officials call for an evacuation, the smartest thing to do in a flood is stay off the roadways. Now is the time to prepare for this weekend’s rains and flooding, if you have not already done so. Follow FEMA’s guidelines for preparing for a flood. Know your flood risk, have an emergency plan, don’t drive through flooded roads, and have an emergency supply kit in case you lose power or cannot leave your home immediately. If your neighborhood, workplace, or route to work has flooded in the past, be prepared for it to do so again. Even if your area does not normally flood, it’s a good idea to be prepared for any unforeseen flooding, potential wind damage, or power outages. 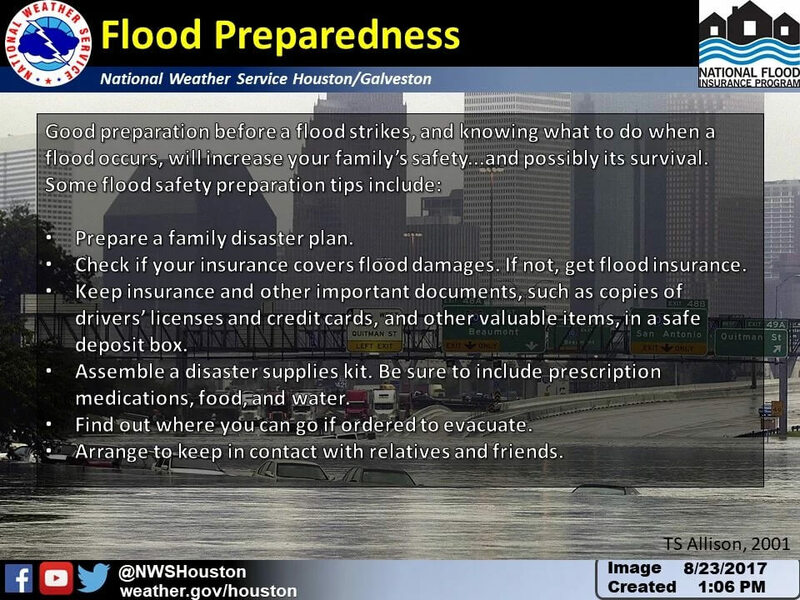 Flood preparedness information from NWS Houston/Galveston. We understand that this is a stressful time for people. Bad weather disrupts everyone’s life, and the uncertainty can be difficult to deal with. What we’ll continue to try and do here is provide the best information we have, while also stating clearly what we don’t know. In regard to forecasts, we’ll have a comprehensive update early Thursday morning based upon the latest available data. For Houston and Texas, the rains cometh. But where? In terms of the amount of rainfall, can we expect considerable rain from Friday through Sunday with the worst on Monday & Tuesday? Or is this too difficult to forecast at the moment? Right now it looks that way, but it really depends on the evolution of that forecast track in the next few days. Thank you for your constant updates. Any thoughts about possible cancellations of HISD schools next week? We weren’t here for Allison or Ike so any info would be great! I wouldn’t presume to know what goes on in their decision making process–however, I’d imagine HISD, as well as the other regional school districts, will take a long look at what to do Monday. I would recommend following them on twitter (@HoustonISD), or sign up for their text alerts (http://www.houstonisd.org/texting, and hopefully they don’t spam people!). Local news stations are also pretty good about getting the word out as soon as they know about closures. Allison happened in June of 2001, so no school to contend with. Majority of the flooding was on a Friday night. Thanks for always keeping it real and not making things sound worse than they are. Also thanks for always being honest about what you don’t know. Your reporting is a breath of fresh air! I love getting this information without all the hype and drama! Thank you! Thank you. Y’all do a really good job providing an assessment, giving the information you have on hand. I appreciate the “no drama” approach. I land at IAH at 11am Saturday morning… what do you think about the drive home to Memorial? Thanks for all the level-headed advice! The rain will be here by then, but it won’t be too bad by noon on Saturday. Just double-check the conditions as you’re driving home and stay safe! 1. Eric, you said we’d get “some gusty winds.” How gusty? 2. Is forecast still on track for Corpus Christi? What are the chances of the storm heading towards Northern Mexico instead of looping back to the Texas coast? Will the heavy rains start on Friday morning or afternoon? Or is too early to tell? I guess Harvey is no longer just a friendly, imaginary 6’3″ rabbit…. Imagining Jimmy Stewart as a meteorologist through the evolution of media since that motion picture release. If I look at the latest computer models correctly, it looks like Harvey lands about where predicted, but then takes a hard left. If so, I would think Houston is too far for any serious repercussions. Thoughts? Thank you all. We are following. Thank you so much for the inland flooding article. Now with the newest track, it looks like it’ll either be the storm that won’t die and swings back into the Gulf or it meanders off into Mexico like the invisible rabbit of the movie and as it was originally predicted. Has there ever been a storm with such a complex, unpredictable course before? Nothing too extreme for you. Can’t make that call. Definitely iffy. We’ve rented a cabin in Port Bolivar for this weekend? Should we be concerned about storm surge? Moderately concerned now, even more so if Harvey continues to strengthen into a Cat 1-2 hurricane. How’s flying out of IAH on Saturday morning look? What about coming back to Houston Tuesday evening? Flight out seems probably OK. Flight back is highly iffy. It doesn’t appear from the forecast that the “cold” front to the northwest will affect the severity of the storm, other than to keep it in our area. What are your thoughts on its effects on both rain and wind? Let’s include downstream flooding in the discussion of this much rain falling someplace in Texas. Was just as Sam’s Club and what a madhouse! People are panic buying water! Folks, even during Ike and Alison, the water nor the gas never went off. No need to panic. Even if it floods, at most it will be what, 1-2 days, before it recedes? But how long will the rains go on? The waters may recede in 1 or 2 days, but if it rains for 3 days and you’re stuck at home, that’s 5 days without water and food potentially. Also certain parts of the area will recover faster than others also. If you live in the outskirts and/or near creeks and bayous it may be a while before you can get help or get out. You do realize you can get water by turning on your faucet, the odds of losing the water supply is almost nil. I blame the media for whipping people into a big panic. Great if your a water bottler. You do realize that in the event of power outage, water purification systems may not work properly if people are even able to get water from faucets. And if people are getting water from wells, they should NOT be opening faucets during a power outage as that introduces bacteria into system. Contaminated water should be boiled, but if power is out and people have electric stoves, they’ll need to use bleach, water purification tablets or bottled water. Also power outage = no A/C = need to drink more water to stay hydrated. The chances are low there will be a power outage, but why take the chance? You can drink the water later. Will most of the worst winds be to the West of Houston when Harvey makes landfall, Eric? Gusts around 40mph seem like a reasonable worst case scenario. Great job, Eric. I learn more from you than all of the cable networks combined! 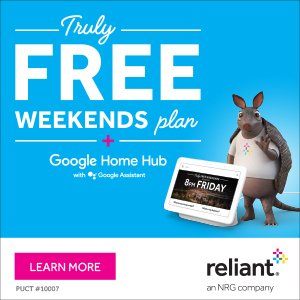 Connecting thru Houston on Sunday (in at 1300, out at 1430), chances I will be camping in airport? I think if you’re allowed to land in Houston, you’ll be able to take off.